The gabion mesh by Nuova Defim successfully passed the "salt spray test"
Oxidation, better known as rust, it's a real threat to steel products, even when they are galvanized. Just consider the effect that the oxidation can have, for exemple, on the gabions that are commonly used not only for wall retaining or river embankments, but also for the protection of military sites, or for "private" applications such as in the case of gabions used as fences. Gabions quality therefore depends much on their resistance to oxidation, that besides weakening the steel structure, it also gives a bad aesthetic impact. 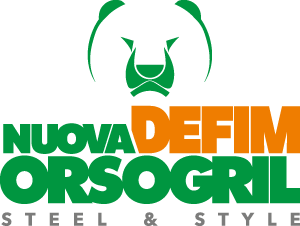 For this reason, Nuova Defim decided to have their gabion mesh stressed tested to proof their corrosion resistance by the "accelarated corrosion tests in salt spray cabin". These tests are carried out in a specific test room and prove the time duration of articles made of different materials with different galvanic facing or protective coatings. Salinity in fact is a corrosive agent capablle of attacking the steel surface and favouring the rise of rust. The most exposed points to the pollution agents are the welding knots. DIN EN ISO 9227-NSS is a technical standard that although does not make clear any criteria of acceptability, it gives technical details on how the tests should be carried out. UNI EN ISO 10289 instead provides the laboratory with indications to quantify the corrosion on the test sample, rated from 0 to 10 according to the percentage of defects found on it (from 0 to 50%). The first column indicates the amount of visible oxidation accumulated, ie the % oxidation in relation to the area concerned, pointing in the right column the corresponding rating. The mesh has successfully passed the test (Rating 10/10) as it showed no signs of red rust after 2000 hours, showing only some white oxidation due to heavy saline environment. Even in this case, the test was positive and the corrosion resistance has beeen proven scientifically. At the stroke of 2000 hours, it is confirmed the highest rating (10/10). In fact, the first signs of red rust appeared only after 2952 hours exposure, which corresponds to a rating of 8 out of a possible 10. In additions, the rust has never attacked the wire on its surface, but only showed a few traces very limited to welding areas and only after a long period of exposur. The successful tests results put Nuova Defim gabion mesh at the top of highly performing European quality and corrosion resistance products. For more information please conctact our Technical department, or see our offer.